Come and join us for a fun filled weekend with 2 stages of live music, artist and craft booths, dancers, community groups, food, face painters, sword fights and so much more. Reconnect with people you haven't seen since you had a full head of hair and wore bell bottoms! Many of our performers are "kids" returning to our old stomping grounds to rock once again! 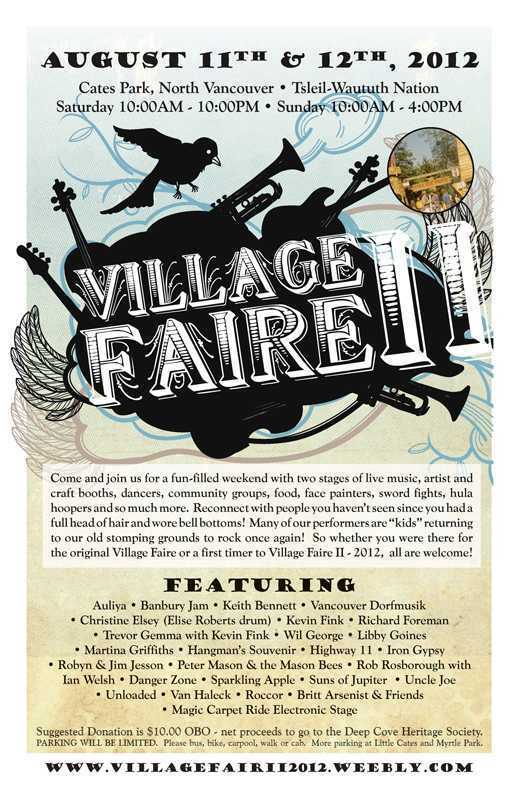 So whether you were there for the original Village Faire or a first timer to Village Faire II - 2012, all our welcome! Suggested Donation is $10.00 OBO - net proceeds to go to the Deep Cove Heritage Society. We are currently seeking donations to cover out costs. Please go to the "DONATE" button as above or proceed to the donations page. "PARKING WILL BE VERY LIMITED" Please bike, bus, boat, cab, carpool or walk. Additional parking at little Cates, Myrtle Park & McKenzie Barge.